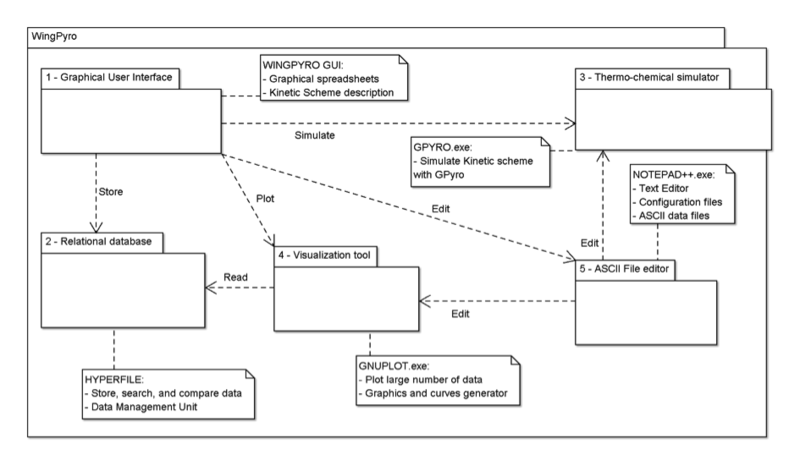 This tool collates, within a single platform, a kinetic model simulator with a database (parametric and experimental), a graphics editor with a model comparison and validation module. Finally, it also incorporates a kinetic parameter determination tool based on the Hybrid Kinetic Method, making it a comprehensive, robust and intuitive tool. 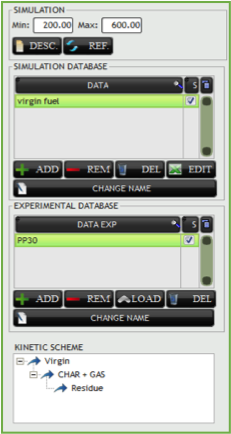 This graphical interface is an absolute necessity as it allows users to easily manage their input and output data. 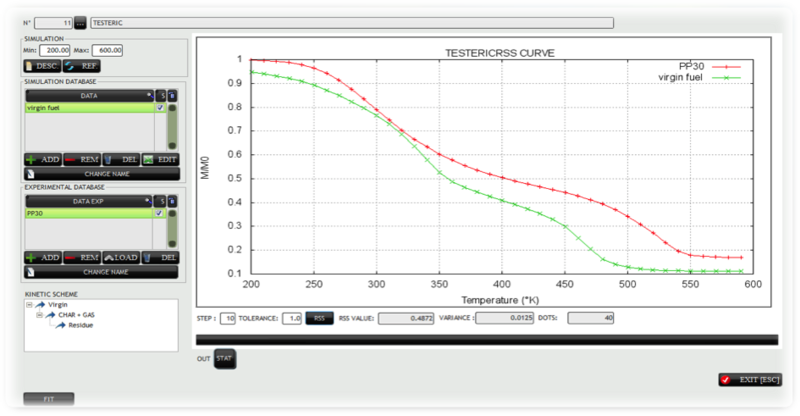 Numerical and experimental data can be compared through this interface, facilitating the interpretation of thermochemical simulations. The implementation of a database is crucial in terms of managing data upstream and downstream of the simulation. 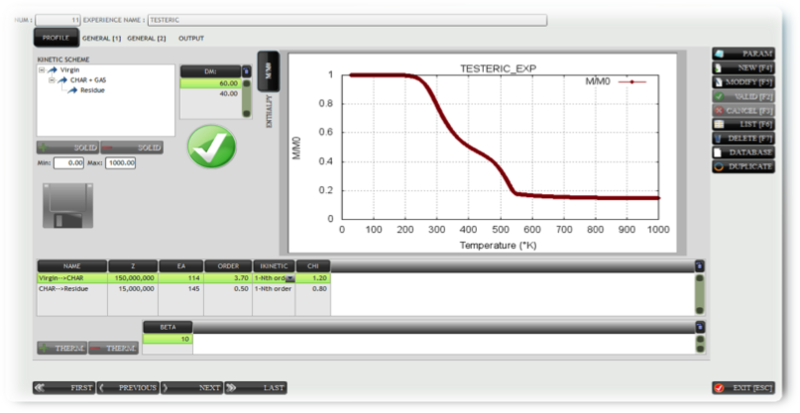 This module ensures the storage of data and manages the physical parameters: the physicochemical properties of the fuels as well as the kinetic parameters. The real value of this database resides in the fact that it incorporates a method for determining thermokinetic parameters. This functionality is particularly useful when the user is looking for new reactions, the parameters of which are unknown. This model is dedicated to the modelling of kinetic patterns through the use of the Gpyro code. The Gpyro code, developed at the Massachusetts Institute of Technology (USA) can be freely accessed and is in the public domain. In this first version of the WinGpyro software, the Gpyro code is used in its simplest form, which is an 0-D code for heat conduction. The aim of this module is to facilitate the processing of post-simulation data. For this module, we selected the GnuPlot tool which offers the advantage of working on all computers irrespective of the operating system. This item ensures the management of all files in "text" format (order, settings, data, etc.). The architecture of the WinGpyro’s platform is based on the five above-mentioned modules. All of these modules interface with one another as per the image below. The software has been appraised by SATT Sud-Est and has been declared with the Programme Protection Agency. It is currently in the incubator phase.